with photographs, panorama-pictures, information and booking / reservation possibility. Location: The Coral Resort is located in the north of Kai Bae Beach - have a look at the map: just click the Ko Chang logo top left. 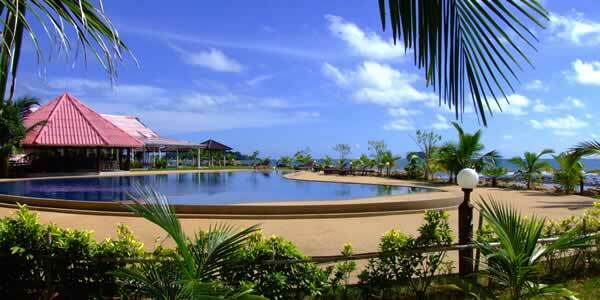 The Coral Resort is the southernmost bungalow resort of the northern part of Kai Bae Beach. 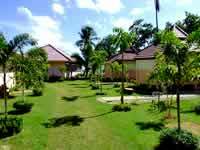 It is build on a small headland and therefore you’ll have a breathtaking view to the south as well as to the north of Ko Chang. In the south this beautiful bungalow resort borders to the klong (river) and is connected by a bridge to the southern parts of Kai Bae Beach. There is no sandy beach at Coral Resort but in the north it adjoins to the sandy part of Kai Bae Beach, direction south it’s only a few hundred metres to the sandy beach. 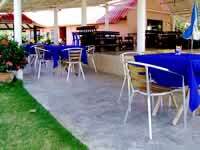 Besides the different bungalows and rooms, a big open restaurant is part of the Coral Resort. There you can order Thai specialities as well as snacks and western breakfast. Directly beside the restaurant there is the bar, also open in all directions, where you can enjoy chilled longdrinks, cocktails or non alcoholic drinks either on the barstools or in the comfortable sofa. In front of the restaurant a few pavilions were built to have a bit more privacy while enjoying the wonderful panorama view. The big swimming pool was built directly in front of the bar and the restaurant so you will also have a great view into the Gulf of Thailand and the beaches in the north of Ko Chang while swimming or relaxing on the beach chairs. The village of Kai Bae Beach is only a few hundred metres away from the bungalow resort so you can easily reach the shops, bars and restaurant within a few minutes by foot. There are different room categories at the Coral Resort. More information and prices you will find on the booking page (please click the link at the end of the page). From the piers you will reach the Coral Resort at Kai Bae Beach by pickup taxi within about 45 minutes. Please let the taxi driver know the name of the Coral Resort before starting, or get him to stop by knocking on the car-body (the small road leading to the Coral Resort is about a 100 metres in front of the bridge in the village, on the right hand side of the road when coming from the pier). If you arrive by airplane from Bangkok you can take a minibus waiting at Trat airport that will bring you directly to the Coral Resort. Please ask at the pier or the airport for the prices of the pickup taxis and / or minibuses. On request we can organize a private aircon transfer from Bangkok directly to Coral Resort on Ko Chang and/or back. More information on the Transfer-Page (please click on the link). Because Ko Chang is booked out very often shortages in accommodations may occur - so we recommend to book your hotel in advance!